← Solar Dryer Engineering Drawings Ready! 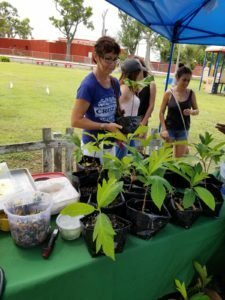 As TTFF spreads our branches … er … wings … we’ve now sent 3,000 donated breadfruit trees to St. Croix in the US Virgin Islands. We owe a huge vote of thanks to Ken Banks and Nate Olive, for getting this to happen. And thanks to an anonymous donor too. 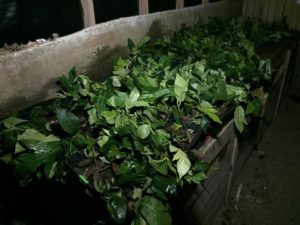 They worked together and took care of all the permits, inspections, shipping, clearing, transportation and re-potting, all the details for a successful transfer. Ken Banks, now the newest member of the board of Trees That Feed Foundation, led a number of events. He participated in their agricultural fair, and distributed over 900 of these trees to individuals, in one day! The rest are allocated to various farms on the island, as coordinated by Nate. Then there was a “slow dinner” at which various breadfruit dishes were served. 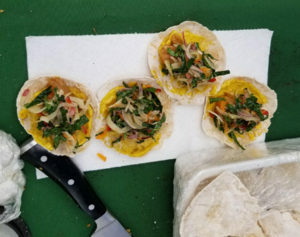 Some of the new recipes included tortillas, chaya fritters, breadfruit dumplings in grouper broth … and last but not least … breadfruit vodka, by Chef Todd Manley. There are a few photos, below. The potential for breadfruit, fresh or transformed into some kind of delicacy, is bright in St. Croix. The people that made it happen! 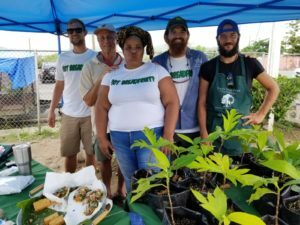 L to R, W Louis Hilgeman, Ken Banks, Sommer Sibily, Forest Stewarship Coordinator, US VI, Nate Olive, and Chef Andy Thaldorf, proudly wearing his TTFF apron! Before we forget, Ken also transported various components of the TTFF “Factory in a Box.” The shredder and grinding mill will allow fresh breadfruit to be processed into a nutritious, gluten-free flour with a long shelf life. This entry was posted in Blog, Breadfruit, Recent News, Recipes. Bookmark the permalink. Nice to hear from you Michael. Please let’s stay in touch. I was so excited to read about your many endeavors to increase food security by teaching about using locally sourced food items. While I do not live in a part of the world that grow tropical veggies/fruit I would like to learn how to make breadfruit flour. For the past two decades I have been living a vegetarian life style, eliminating as much processed ingredients from my diet as possible. My local grocery store occasionally sells breadfruit and I see making my own homemade flour as a huge improvement in the flours currently available commercially.